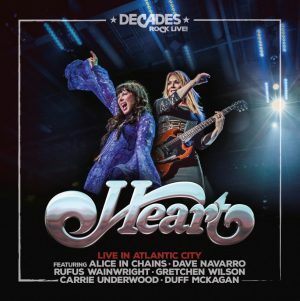 A welcome resurrection of Heart‘s 2006 VH1 concert at the “Decades Rock” Arena in Atlantic City. Despite the fact that Heart are a “35 million albums sold” rock band, it’s hard not to focus on the big name guests who appear on this remastered live album. And yet none of them attempt to steal the attention for themselves. Ex Janes Addiction and Red Hot Chilli Peppers guitarist Dave Navarro guests on the first three tracks. His unavoidably turbulent personal life was equally unavoidably reflected in the darkness of his music, so it’s perhaps no surprise that his thundering guitar underpins opener and title track from Heart’s 1980 album, Bebe Le Strange, a song “inspired” by a warped love letter from a fan with questionable motives. He’s there too on ‘Straight On’ and ‘Crazy On You’. He steals nothing from these either … there’s no attempt to outplay the house band, he just adds layer upon layer of darkly coloured textures, alternately acting as cushioning for the melodies or stoking up some heat, flames licking around the edges of Wilson’s fiery delivery. It’s also hard to avoid the fact that the set list seems chosen almost exclusively from a time when the band’s material looked to catch the hard rock storm that swept through the seventies. Nothing wrong there, of course. Their Led Zeppelin influenced writing – at a time when LZ were unknowingly going through an unrepeatable purple patch – resulted in ‘Even It Up’s ricocheting riff and piston pumping chorus, as well as sparking the incendiary ‘Barracuda’, full of venom and pent up angst, with which they fittingly climax the set. The underlying air of menace that typified the “grunge” era’s brand of hard rock gets an emphatic push by the appearance of Alice In Chains. The sisters join them for the downbeat ‘Would?’ and ‘Rooster’, two dramatisations of death and tragedy that seem out of place sandwiched between the “peace and love” lyrics of ‘Lost Angel’ and the youthful innocence of ‘Magic Man’. But they get a hugely enthusiastic reception from the audience. Maybe two great rock bands on stage is enough of a thrill no matter what they’re selling. Elsewhere, Carrie Underwood and the always underrated (except by his fans) Rufus Wainwright pitch in with some telling affirmations of the notion that there’s some serious talent on display tonight. Wainwright’s measured baritone glides gracefully through ‘Dog&Butterfly’, and Underwood’s finely judged contribution to ‘Alone’ are unarguably two of the evening’s surprise highlights. They add to the overall effect of an eminently successful band surrounding themselves with disparate friends and deploying their strengths, some contrasting, some complimentary, to extraordinary effect. It all adds up to an immensely entertaining evening.